Betfair offer 20/1 Man City to beat Everton on Monday night! Risk-free! Manchester City are huge favorites to beat Everton in the 2017/18 Premier League 2nd Matchweek on Monday night. Are you backing Manchester City to beat the Toffees? 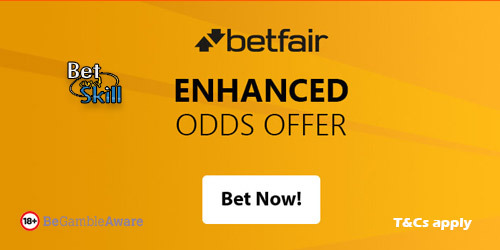 Boost your profits at Betfair! Get 20/1 Manchester City to win the match! It's risk-free! Manchester City had to work hard by a stubborn Brighton on the opening day. The Citizens are unbeaten at home since losing 3-1 to Chelsea on December 2016 and are heavy backed to get all three points at Emirates Stadium tonight. Don't miss this massive price boost! 20/1 Manchester City to win is a real bargain! 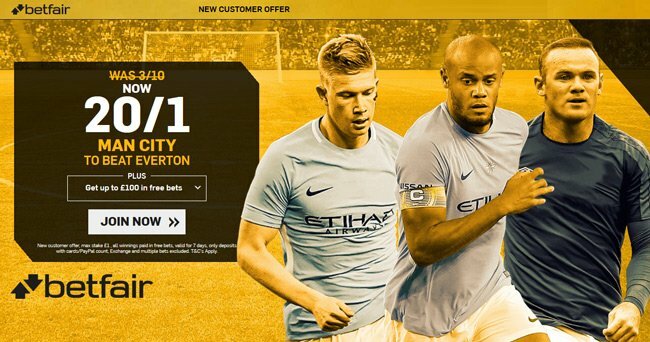 Place your first bet (max £/€1) on Manchester City to beat Everton at the current Sportsbook price. If Manchester City fail to win the match, Betfair will refund your bet up to £10. Place a bet on Man City to beat Everton in the 'Match Odds' market at the enhanced price on the Sportsbook. Max stake £1. "Betfair offer 20/1 Man City to beat Everton on Monday night! Risk-free!"